Marilyn SanClemente April 7, 2017 April 7, 2017 All Occasion Card, All Occasion cards, handmade card, Handmade cards, Occasions catalog, Stampin' Up! 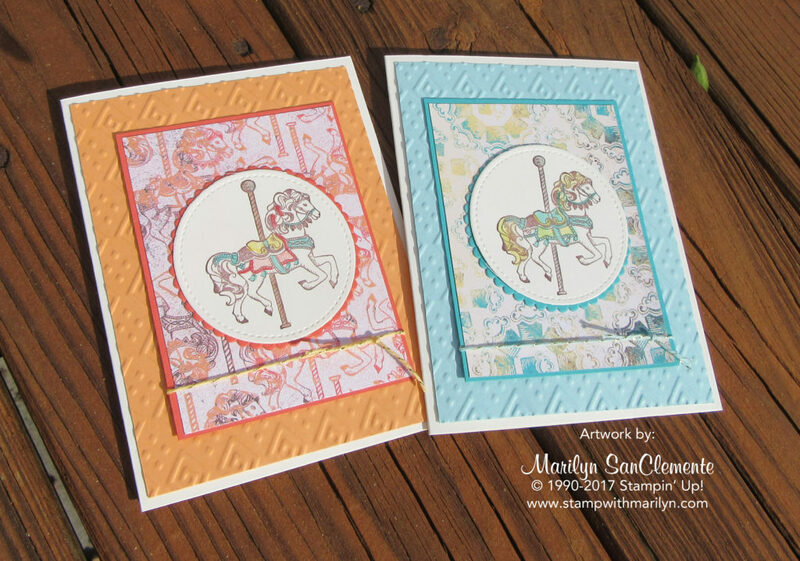 Today I am sharing a card that I made with the Carousel Birthday stamp set from the Stampin’ Up! Occasions catalog. I love the Cupcakes & Carousels Designer Series paper stack. The paper has a very shabby chic look with a combination of great colors! There is a Calypso Coral hue and a blue – Bermuda Bay hue. This is my “stepped up” card with lots of detail. I was looking for some cards to make for swaps at Stampin’ Up! OnStage event in Richmond. I also wanted to make a card with more detail to keep for me and use for a future class. Here are the two color combinations. The card base is So Saffron cardstock cut to 5 1/2″ x 8 1/2″ and scored at 4 1/4″. Next is a layer of Pool Party cardstock that I have embossed with the Boho Chic embossing folder. The center piece is a 4″ x 3″ piece of the Cupcakes & Carousels designer paper with a layer of Bermuda Bay cardstock that is 4 1/8″ x 3 1/8″. 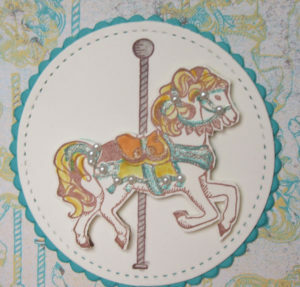 The Carousel horse is stamped with Chocolate Chip ink and colored with the Watercolor pencils and a blender pen. These are stamped on Very Vanilla cardstock. The Circle and Scalloped circle are cut out using the layering Circles Framelits. The Baker’s Twine is part of the Cupcakes & Carousels Embellishments kit. For the detailed card, I stamped the horse a second time and layered it on the first horse to make the layer pop. I added a touch of wink of Stella to the Bermuda Bay areas of the horse’s saddle which you can see in the close up. The second card is made with the coordinating Calypso Coral color hue. The card base is Very Vanilla cardstock. The first layer is a 4″ x 5 1/4″ piece of Peekaboo Peach cardstock embossed with the Boho Chic Embossing Folder. I used the small Pearl Jewels to accent the details of the saddle. So which color combination do you like better? Can’t wait to see what i get back for swap cards tomorrow!